The Japanese fire bellied newt (Cynops pyrrhogaster), called ‘Akahara Imori’ in Japan, is one of the most studied amphibians in a broad spectrum of life science fields. 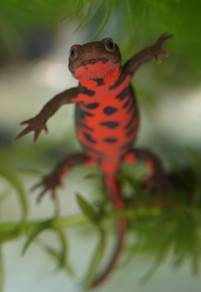 Here, to accelerate studies using this animal, particularly those concerning stem-cell/development, metamorphosis, regeneration, reproduction, sense, and evolution, the Japan Newt Research Community (JNRC) provides ground information for transcriptomic and proteomic approaches. Toride Imori, a race of the C. pyrrhogaster newt, that was originally caught from a restricted area (~25 km in diameter) in Japan (Kamogawa city, Chiba prefecture), and reared in the laboratory or a field Imori-no-Sato (Kaizuka/Kamitakai, Toride city, Ibaraki prefecture), was utilized in this project. Standard or normalized cDNA libraries for mRNA-seq were constructed from total RNA samples collected from target tissues. Paired-end sequencing (100bp x2) was carried out by Illumina HiSeq2000/2500. Three algorisms, Trinity, Trans-ABySS and Velvet-Oases, were applied to de novo assembly. You can use our BLAST server to align a given sequence to transcripts. *The data can be used for research purposes only. Contact us imori@imori-net.org, if you use the data for commercial purposes. Copyright (C) 2013- Japan Newt Research Community. All rights reserved.